If you can determine the reason why your dog is digging then you can stop it. It is definitely possible to learn how to stop a dog from digging. The problem is that you’re not always there when the digging happens. You might be distracted inside your home or you may be a work when it’s happening. In this article we’re going to look at how to determine why your dog is digging, how to distract him or her from digging and how to protect your garden from any future attempts at digging. Your back yard can quickly become what looks like a war zone of one hole after another if your dog has a digging habit. It can destroy the soil balance, kill the grass, uproot flowers and lower your home’s value if your yard continually looks messy, muddy and dug up. Dogs of all ages and stages dig for different reasons and if you discover the particular reason that your dog is digging, then you can stop the behavior. This is difficult if you’re not there when your dog digs. You may need to devote your time to being there with your dog until he or she is trained to stop digging. Alternatively, you can install an outdoor wifi camera to monitor what’s going on in your yard. These cameras are no longer expensive and they are also easy to install. You can view your yard from work or elsewhere on your smart phone. This is a great way to keep an eye on your dog when you’re away from home. Puppies dig because they have short attention spans and they’re full of energy which they need to use up. If you want to learn how to stop a dog from digging consider a puppy’s boredom. They get bored very easily – especially if they’re not with playmates. So when they’re outside they’ll start digging as a way to entertain themselves. Why do adult dogs dig? Adult dogs dig because they’re bored but they also dig when they catch the scent of smaller animals they may perceive to be prey. Small animals like to burrow under the ground. When your dog smells them, he or she is going to energetically dig up the yard trying to locate that animal. Why do senior dogs dig? Senior dogs often dig holes because they’re looking for comfort or relief. To learn how to stop a dog from digging, consider your dogs comfort needs. If a senior dog is overheating in summer they will dig and if they’re suffering from joint pain they will also dig for this reason. Lying in the cool, soft soil eases their bones and provides cushioning. You need to recognize this in your senior dog and provide other means of comfort. What if my dog is obsessed with digging? Many dogs are just more prone by their nature to dig than other breeds. But that doesn’t mean you can’t end the behavior. You can learn how to stop a dog from digging. 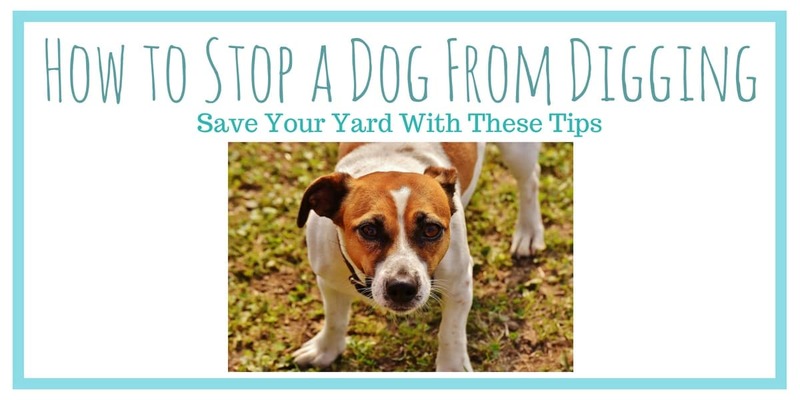 There are ways to train your dog and protect your yard. First, make sure that your dog gets plenty of physical exercise as well as mental stimulation from activities so that he or she doesn’t dig just because of boredom. Certain breeds need more mental stimulation throughout the day and all dogs can benefit from learning to solve dog puzzles. If you need mentally stimulating dog toys, take a look at the best examples of them here. If your dog is needing more activities to do during the day, you may want to rotate through several toys each week to keep them interesting. What are the advantages of a sand pit? To learn how to stop a dog from digging you may want to consider a sand pit. If your dog is a natural digger, you may want to assign him a spot in the yard where it’s okay for him to dig. Some people call this a doggy sand pit but it doesn’t need to contain sand. You can divide off an area filled with dirt from your garden and use it as a digging pit. This saves your garden beds, grass and all other areas of your yard from future digging. You can teach your dog to go to that area only. Dogs also dig holes because they want to bury their toys or anything else that they deem important to them. Remember to always reinforce good behavior but stop bad behavior immediately. To train your dog to start digging in the allocated area you can bury a Kong with treats or favorite toys and encourage your dog to start looking for them. This will not only give your dog a specific digging area, it will also become a game if you continue to bury treasures there when he or she is not looking throughout the week. How to stop a dog from digging under the fence? Sometimes dogs dig because what’s on the other side of the fence seems a lot more exciting than the yard that they’re in. If you’re dealing with this situation it can be difficult to curb their behavior. Try to stop the digging at the fence as soon as you’re aware of it. Go outside and distract your dog to let him or her know that you don’t approve. To stop a dog from digging under a fence, you have to constantly watch your dog until trained to know that these actions aren’t acceptable to you. The moment your dog begins to sniff around and begins to scratch at the grass near the fence, interrupt him/her. You can use a training whistle, coins in a tin can or some other object to get his/her attention. When he stops digging, give your dog something else to do like play with a toy or play a game of fetch. This is a time-consuming task but it is well worth the end result. 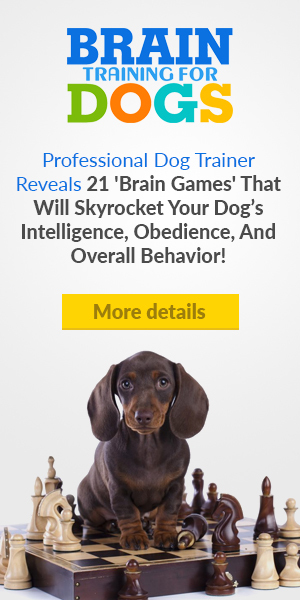 If you want to improve your dog’s behavior overall and get your dog to respond better to you, then you should consider Brain Games for dogs. You’ll love the results you get when you teach your dog these new tricks which help your dog to avoid boredom and be better behaved. If you want to know how to stop a dog from digging, consider this product. If your dog is trying to dig under the front fence to get out, here is another idea to consider. Try installing a dog-peek bubble-window like the one shown below. These are a great idea for curious dogs who want to see what’s going on outside their fence. This Dog Peek Fence Bubble Window (above) is perfect for curious dogs and will help prevent digging under the front fence. Click Here for more details and the current price. If your puppy is digging you need to stop him/her from digging as soon as it starts. If your dog starts sniffing and pawing the ground, interrupt the behavior and provide a distraction. To know how to stop a dog from digging you need to stop it as it begins. Adult dogs who dig may be doing it because they’re after a small animal. When this happens, you have to interrupt that behavior every time he digs. If possible try to eradicate burrowing animals from your front and back yards. If you have a senior dog who is digging you’ll need to consider what your dog’s needs are at this stage of life. Take a look at cooling elevated dog beds if your dog isn’t comfortable in the heat of summer. Also, if your dog is large and suffers from joint pain you may need to consider a new dog bed that has more support and comfort under your dog. Many dog beds collapse after a short time so that they no longer provide the comfort your dog requires. If you can reduce pressure points by using the correct dog bed you’ll find your dog no longer needs to look for comfort outside by digging up the yard. If your dog is a digger, you really must train your dog to come to you the second you command him or her to do so. Then, if your dog starts digging, get their attention and order them to come to you. When your dog obeys, give a treat. This is not only important for solving the digging problem but it’s also important for safety reasons too. As long as your dog will come when commanded then you can keep your dog safe from traffic or other potential dangers when they occur. This entry was posted in Dog Training on July 6, 2018 by Didi.